One of the features of my near-defunct weblog, The Confessing Reader, was the posting of the commemorations of the saints in the sanctoral (saints’ days) calendars of the Churches of the Anglican Communion, along with some commemorations from the Lutheran Book of Worship and others (principally because that weblog also served as a conduit for English-language news from the confessional, that is to say theologically conservative, Christians in the Scandinavian Lutheran Churches, particularly in the Church of Sweden). This weblog will continue that function of The Confessing Reader. For each commemoration, or “lesser feast” as The Episcopal Church’s sanctoral supplement to the Book of Common Prayer described them, I will post a brief biographical sketch, the collect for the commemoration, and the propers for the day (or a link to the Lectionary Page’s propers for the day). For most of the posts, there will also be an icon, or an iconographic depiction, of the saint whom we are commemorating and for whom we are giving thanks that day. 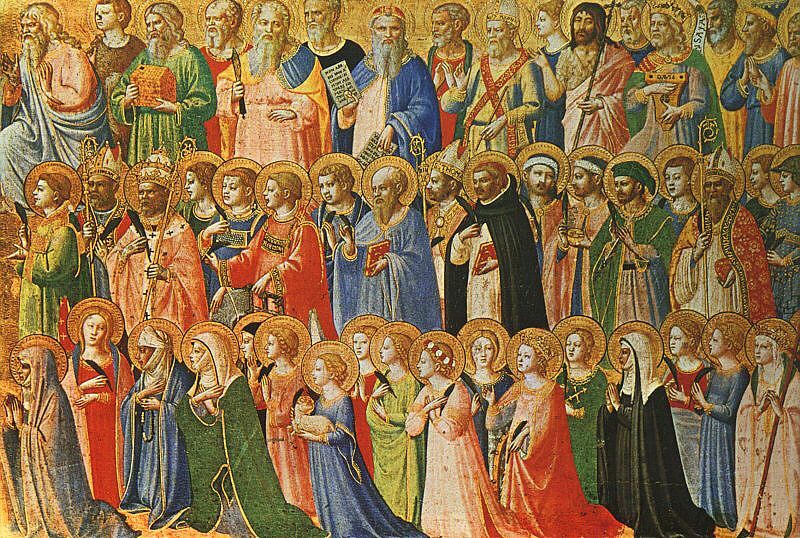 My prayer is that this will provide a devotional help to enable us more nearly to realize what we confess in the Apostles’ Creed: “I believe…in the communion of saints”. While most of the entries will be sanctoral commemorations, I will also provide brief descriptions (and icons or other artwork) for those Feasts of our Lord that fall outside Sundays (such as the Holy Name of Jesus, the Epiphany, the Presentation of our Lord, the Annunciation, etc.). I also hope that this weblog may make some contribution toward the formation of a sanctoral Calendar for faithful North American Anglicanism, represented at the present time not only by the confessional Anglicans remaining in The Episcopal Church, the Anglican Church of Canada, La Iglesia Anglicana de Mexico, and Iglesia Anglicana de la Region Central de America; but also the Church in Haiti and in the Dominican Republic (which are dioceses of The Episcopal Church) and the Church in the Province of the West Indies; as well as the diaspora Anglican bodies in North America: the Anglican Church in North America (ACNA) and its subjurisdictions, the Reformed Episcopal Church (REC), the American missionary district of the Anglican Church of Rwanda (PEAR-USA), the Convocation of Anglicans in North America (CANA); and the Continuing Anglican Churches. O God, the King of saints, we praise and glorify your holy Name for all your servants who have finished their course in your faith and fear: for the blessed Virgin Mary; for the holy patriarchs, prophets, apostles, and martyrs; and for all your other righteous servants, known to us and unknown; and we pray that, encouraged by their examples, aided by their prayers, and strengthened by their fellowship, we also may be partakers of the inheritance of the saints in light; through the merits of your Son Jesus Christ our Lord. Amen. You’re most welcome, John. I think of it as a ministry to the Church and the wider world. Thanks for this – I appreciate it as a resource. This would not be Scott Moncrieff who was at CCSL from time to time would it? Thank you so much for this precious gift. I am not new to Jesus but new to the richness of our history and the book of common prayer. This site is an invaluable tool to increase devotion to Christ and connection with our extended family. I know He is pleased with this work. Thank you for your blog. I reference it quite often to many of my Baptist and Non-denominational colleagues. As an Anglican cleric, it is important that we educate all Christian clergy regarding the saints of out past. Its one of the reasons why I made the switch to Anglicanism. I also have your blog listed on my blog as one of my favorites. Thanks! (Revd) Mr Hairston, many thanks your generous comment, for referring free church colleagues to the posts, and for listing my blog as a favorite. Please send me regular posts. I have only just found your work, and am delighted and thankful. I don’t really know how your work “works”: do you send posts on saint’s days, or are we to come here to pick up your gleanings? Thanks again for all you do. Sharon Forrest. Sharon, I don’t actually send posts to folks. You will need to check in daily to see who is being commemorated. It does make me consider that I need to add some sort of subscription function, though. I’ll see what I’m able to do with WordPress. This is a wonderfully put together resource. I feel like I should be more familiar with those Christians through the ages who fought the good fight, ran the good race before me. So it was such a blessing to find this blog. Hello, Todd, and thanks for your good work here in keeping the saints before our eyes. Thanks, Brother Tobias. I’ve updated the link, and I’ve gone ahead and amended my post on William White with the addition of your new icon – if that meets with your approval. Thanks; and keep up the great work. This is a very valuable site for those seeking info on the holy ones…. We forget the saints and their example and encouragement at our peril: the church is a community across time as well as across the globe. Yes the same Scott as was at CCSL once, now at St George’s Goodwood. Welcome back and it is a welcome sight to have you back! Certainly have missed you (though your archives are splendid so did the trick in the mean time). Shot up the occasional prayer for you in case you were not well or you were encountering any difficulties. I have just discovered your blog, having googled Scholastica, sister of Benedict, who is commemorated today. One of the benefits of using the CofE’s daily prayer web site is the reminder of saints being commemorated. As a Free Church background Anglican priest (now retired) I value the history and example of those who have gone before, which would have remained lost to me in the Free Church world. Thank you for this gift.